Bathing water at natural bathing sites is a body of surface water – i.e. running and still inland water (rivers, lakes) and coastal water (the sea or part of the sea). The bathing water areas, i.e. areas where is normally large number of bathers and bathing is not prohibited, are determined in the Decree on Bathing Water Areas and the Monitoring of Bathing Water Quality (OJ RS No 70/03). The bathing water quality must comply with the requirements of the Rules Regarding Hygienic Suitability of Bathing Water (OJ SRS No 9/88). The goal is to establish the actual status of bathing water quality in Slovenia, implement control at individual natural bathing sites and bathing water areas with a view to protect human health, determine quality trends and propose measures for the improvement of bathing water quality. In 2003, the following new implementing regulations for the control of natural bathing sites and bathing water areas were adopted: the Decree on Bathing Water Areas and the Monitoring of Bathing Water Quality (OJ RS No 70/03), the Rules on Detailed Criteria for Determining Bathing Water Areas (OJ RS No 79/03) and the Rules on the Quality of Bathing Water (OJ RS No 73/03) which were harmonized with the EC directive from 1975 (76/160/EEC) and the Water Act (OJ RS No 67/2002). In 2002, 10.1 % of all the samples taken at bathing sites by the sea were microbiologically not in compliance with the regulation and only one sample was physically and chemically not in compliance with the regulation. Therefore, we may assess that the water of bathing sites by the sea complied with the prescribed requirements for bathing waters. For the purposes of microbiological tests, there were multiple samples taken from inland surface waters, i.e. Lake Bled, Lake Bohinj and the Šobec pond; of the total of 50 samples taken from 9 bathing sites, only one sample failed to comply with microbiological criteria. The number of samples taken for the purposes of physical- chemical tests was smaller by almost half (3 a season/bathing site); there was a total of 4 failed samples, 3 of which failed to comply due to the exceeded content of nitrates. We may assess from the results that the water at these bathing sites was suitable for bathing. We could give similar assessment for several other bathing sites at the Kolpa River, however, it would be necessary to increase the number of samples to obtain a more realistic assessment. At all the remaining locations at inland surface waters and by the sea, where people bath at their own risk, less than 3 samples per season were taken, at 65 bathing sites only once and two to three times at 52 bathing sites. 45 % of tested samples taken from these bathing sites were polluted by faeces. 27 % were also chemically polluted, 50 % due to the exceeded concentration of nitrates. Due to the insufficient number of samples taken, the assessment of bathing water quality cannot be given for the majority of these sites where people bath. Bathing sites, in particular those by rivers, gravel pits and ponds, are completely unregulated and unmanaged; there, people bath at their own risk. According to the new legislation from 2003, the Database on Natural Bathing Sites is managed by the Institute of Public Health (IPH) and the Database on Bathing Water Areas by the Ministry competent for the environment. The source for the indicator for the year 2002 (managed by IPH) contains data on the location of a bathing site, name of water and name of bathing site, bathing water type, established control, frequency of sampling, number of samples taken for microbiological and physical-chemical tests, the number of unsuitable samples and cause of unsuitability in line with the applicable Rules Regarding Hygienic Suitability of Bathing Water (OJ SRS No 9/88). With a view to protect human health, hygienic suitability of bathing water is assessed and measures for the remedying of deficiencies and improvement of bathing water quality are determined on the basis of test results. The source of data is the Database on Bathing Sites by Natural Waters, which was being updated and amended annually at the Institute of Public Health in accordance with the data submitted by the regional institutes of public health and according to reporting requirements. The data are reported by the managers of natural bathing sites to the regional institutes, with whom they concluded an agreement, and thereafter the regional institutes submit the data to the Institute of Public Health which draws up an annual report and submits it to the Ministry of Health. Certain regional institutes also take test samples at certain locations where usually a greater number of people bathe at their own risk. In 2002, 168 natural bathing sites and bathing locations were recorded. 19 water samples were taken (weekly) from 20 (12%) bathing sites or bathing locations and 4-5 samples (every 14 days) from 10 (6 %). The Slovenian Health Inspectorate or institutes did not take any samples from 21 (12.5 %) recorded bathing sites or bathing locations. 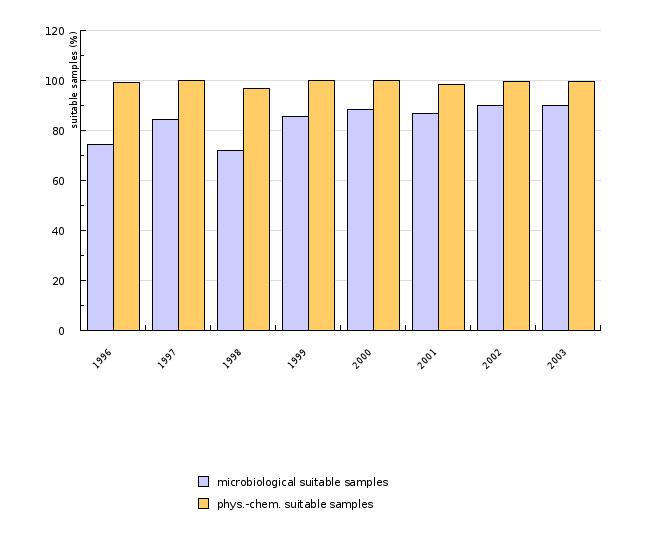 For the purposes of laboratory testing, a total of 1202 samples of bathing water by surface waters were taken; for the purposes of microbiological tests, a total of 620 (51.6 %) samples were taken; and for the purposes of physical-chemical tests, a total of 582 (48.4 %) samples were taken. In past years, the sampling was being carried out, in line with regulations, at the bathing sites by the sea, Lake Bled, Lake Bohinj and the Šobec pond (approximately 45 bathing sites), which are either being managed or have concluded an agreement on control with the regional institute of public health, and at the bathing locations where the institutes implemented monitoring themselves. The data are maintained by the payer. 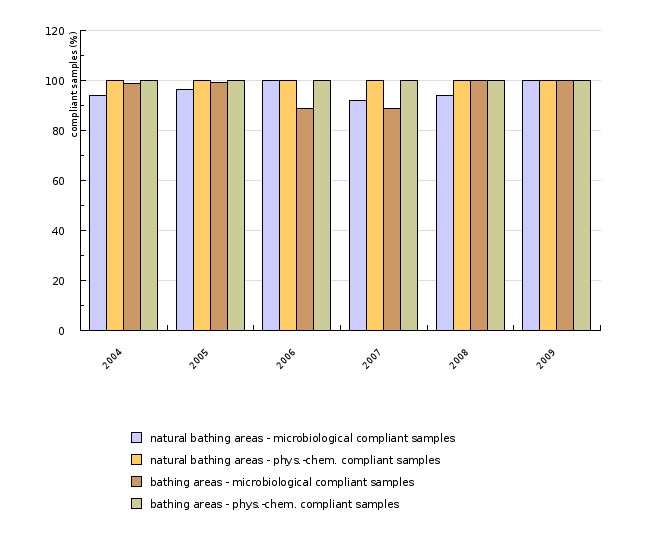 The data on the hygiene suitability of surface bathing waters (reports by regional institutes and IPH laboratories) are aggregated according to the type of bathing water (sea, standing and running inland waters), areas of control – public institutes of public health, frequency of sampling in a season, and according to microbiological and physical-chemical suitability of samples taken by individual types of surface waters. The data are prepared in the form of an annual report to the Ministry of Health of the Republic of Slovenia.